The Rubbermaid Commercial Mega BRUTE Mobile Commercial Trash Can is a highly versatile way to handle large-scale waste collection and sorting. 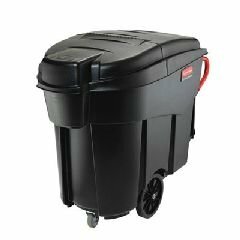 This BRUTE trash can holds up to 120 gallons or 400 pounds of waste, and has diamond pattern wheels and casters plus ergonomic, easy-access rear doors for better maneuverability and efficiency. You can also equip this Rubbermaid BRUTE trash can with an optional full-coverage lid for even greater flexibility.